21st September 2010, Dumgoyne: Glengoyne Distillery - Following a recent 25% increase in case sales Glengoyne has announced a new long-term marketing initiative based on the concept “SLOW”, and is to invest upwards of £1m in the campaign drive over the next two years. 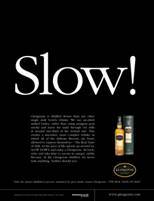 The campaign is centred on Glengoyne’s distillation speed, which is SLOWER than any other Scotch Whisky. Glengoyne attributes its high quality, smooth tasting malt to its slow distillation, which is about one third the normal rate. SLOWLY distilling the spirit allows more contact with the copper stills, removing unwanted sulphur which can result in bitterness and encouraging the formation of esters creating Glengoyne’s distinctive apple fruitiness. The increased copper interaction also helps draw more flavour from the slowly handcrafted Spanish Sherry oak casks during maturation. The campaign is supported by Glengoyne’s Ten Slow Truths, a set of facts that are central to life at the distillery and clearly set out why only the SLOWEST distillation process, untainted by peat smoke creates Glengoyne - The Real Taste of Malt. The Slow Truths contain facts about Glengoyne’s distillation and maturation processes, as well as insights into life at ‘Scotland’s most beautiful distillery’. The Slow Truths have been handed down over the generations at Glengoyne, and the wisdom imparted to every visitor. By sharing the Slow Truths Glengoyne is encouraging drinkers to adopt a slower lifestyle, helping them to slow down, take things easy and spend time appreciating the finer things. A new advertising campaign keeps the message simple and eye catching, highlighting the core Slow Truths and positioning Glengoyne in a unique way, sustaining its point of difference. Greg Buckley of STORM-RDA, one of the creative teams behind the initiative, said of the campaign: “Slow is a simple, bold articulation which communicates a core product truth. Our campaign brings this truth to life via a series of 'Slow' communications showing how taking your time and doing everything properly creates quality, both in product and in life. Iain Weir, Marketing Director for Ian Macleod Distillers said: “The Slow philosophy has worked well for Glengoyne for over 175 years, as great recent sales figures show. We have mastered the art of producing the Real Taste of Malt, using methods handed down over the generations, including the slowest distillation process of any Scotch whisky distillery. Slow is about taking the time to do everything as well as possible, instead of as fast as possible, quality rather than quantity is at the heart of everything the distillery does. Only the slowest distillation process, untainted by peat smoke, creates Glengoyne THE REAL TASTE OF MALT.